The last column by Pip caused a bit of a stir with some islanders: is it possible that low costs airlines will change Lesvos? The only thing I hope is that the Lesvorians don't fancy making their island into a mass tourist destination like Rhodes, Kos or Corfu. They should be proud of their island as it is: the richness of its magnificent nature cannot be found on any other Greek island. Lesvos is a pretty big island (the third largest in Greece) and, certainly, filling the entire island with tourist resorts and villages - as has been done on the island of Rhodes and on the Spanish island of Mallorca - will require Herculean effort from developers. Imagine: in Mallorca you mostly find a traffic jam when attempting to visit any of its remaining green areas. Do we want that on Lesvos? The tourism on Lesvos has been mainly concentrated in the north, around the medieval village of Molyvos, the most popular destination for tourists. 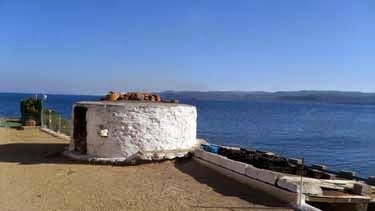 But Lesvos has so many other special places, some of them still not known by people who have visited the island for years. In the area south east of Mandamados, the village of Aspropotamos, the hamlets Agios Stefanos (known for its early-Christian basilica) and Palios held lots of archaeological sites, much of which have been lost, and historians only can guess what this region looked like in ancient times. In the past people did not always recognise what value old ruins could have for their history. The islanders probably did not even dream of strangers coming to Lesvos to admire dilapidated castles and tumbled-down houses. So with no further thought they re-used the stones of strongholds and temples and also helped the rare foreign visitor to find stones with (to them) incomprehensible inscriptions and other archaeological treasures. Although not everybody did so. For the English and other foreigners it was quite normal to ‘save’ archaeological treasures for their museums in those times. The biggest theft in that period happened in Athens, where the then British ambassador to the Ottoman Empire, Lord Elgin, (in those times Greece was still occupied by the Ottomans) took several years (1801 – 1804) to remove the frieze of the Parthenon. He had it transported to England, where he sold the beautyful art piece to the British Museum. The pieces are now known as the Elgin Marbles. Fortunately not everywhere did people have their history stolen from under their noses (Dutch expression). The stone that Newton wanted to take, may still be in the small basilica in Agios Stefanos (there remains a stone with roman inscriptions). And later on the villagers built a new roof on the church. If you continue travelling North towards Palios, in the area of Kafkares, at the estuary of a river, lie the remains of an old castle. In this place there must once have been a big settlement, because there you can find plenty of ruined houses, cultivated stones and lots of shards of ancient pottery. It is thought that this might have been a lively little port, from where jars full of olive oil and wine were transported. A little further on, just beside Palios with its idyllic little harbour, there are graves cut out of the stones of the rough landscape. Palios – now a gathering of not more than a handful of houses – had also been much more lively: until 1922 pilgrims from Ayvalik arrived here in order to visit the Taxiarchis Monastery, that has a famous icon of the archangel Michael known for its miracles. In ancient times, transporting goods like wine and oil was done by earthen jars. Those jars were made by potters and especially in this area near Mandamados, many of them used to live. Quite a few ruined houses have pottery kilns beside their dilapidated walls. The pottery from this region (and that from Agiasos) was once famous all over Greece. In Agios Stefanos a potter lives who still makes pots and plates in the traditional way. The clay is dug out of the ground and is put on the road, where it can be spread by the cars. This part of the process of course is not so traditional: when there were not yet cars, the clay was kneaded by elbows and feet, a very heavy job to get the clay supple. Once the clay comes off the road it is put into water, then it is sieved with some powder added to make the clay more elastic. The making and baking of the pottery does however follow the ancient process: formed by hand, dried under the sun and baked in a traditional woodstove. When travelling through this pottery land, many little pools surrounded by birds and dragonflies will come to your attention. These were all created by the removal of the clay from the ground. Imagine how many plates and jars come from there! Little beaches boarding the crystal clear sea, birds, insects, wild lavender, hidden orchids and plenty of old ruins make this area a great place, full of surprises. I am not sure if the many cows, also wandering free around there, have a place in the history of the pottery. But I am fairly sure that no tourist resort will be making its appearance there soon because the beaches are too small and the landscape too wild.